To commemorate the 100th anniversary of the Anzac landing at Gallipoli on 25 April 1915, this exhibition from the Gallery’s collection explores how Australian artists responded to World War I, both during the conflict and in its aftermath. 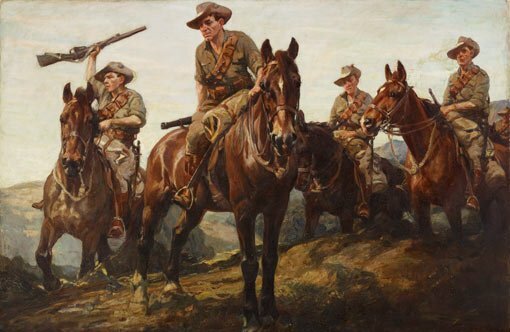 Official Australian war artists, including Will Dyson, George W Lambert, Arthur Streeton, Fred Leist and Septimus Power, were assigned the task of creating a visual record of Australia’s armed forces in action. Other artists, including Napier Waller and Roy de Maistre, volunteered for the Australian Imperial Force. Mad through the darkness also presents, for the first time in a century, a selection of works by Evelyn Chapman, the first female Australian artist to visit Europe’s First World War battlefields. Alongside works created around the time of 'the war to end all wars’ will be Sidney Nolan’s monumental 1957-58 painting The galaxy , depicting soldiers swimming at Anzac Cove as exploding shells light up the vast expanse of inky darkness. Exhibition extended until 27 October 2015.